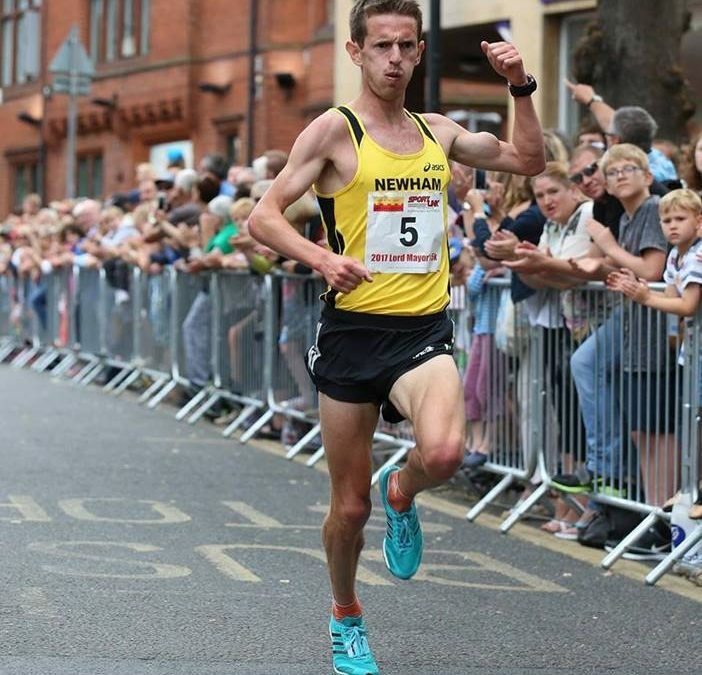 This is John Beattie on his way to winning in Norwich at the Lord Mayors 5k road race last month, in just 14.35 mins. M: First of all, thank you so much for giving your time for this interview! M: Why don’t we start with you explaining to the readers a little bit about your running career to date, and what you are hoping to achieve over the coming months? J: I have ran for many years as a long distance runner, and over time this has varied from anything between 1500m right up to the marathon. I’ve been fortunate enough to have competed all over the world and for the last decade have been a GB / England International runner at many different events on different surfaces and distances. More recently though, as I’ve gotten older I’ve narrowed my focus more just down to 5k-10k on the roads. I was delighted to go sub 30 for 10k for the tenth year in a row recently at the London 10,000m, and now am trying to get in shape to have a shot at a sub 29 road 10k. M: What made you start having them? J: I first started getting massage when at the University of Tulsa on an athletics scholarship. It was included within the scholarship and I was happy to give it a try. M: What happened that made you realise that massage treatments actually helped? J: Not only was I not getting injured, I was also feeling really good physically and this was despite running close to 100 miles a week. For me there was also the mental element – I believed that massage would help me and would always want to get one 2-3 days out from a competition. M: With so many types of massage to choose from (sports, deep tissue, or swedish to name a few), which is your preferred modality? M: How often do you have them? J: I probably average a massage every 2 weeks. It has been weekly at various points during my career, though as I’m not running as much mileage these days going every 2 weeks works well. M: Do you plan them around events, and if so can you briefly give us an idea of what that looks like? J: Yes – I will always look to get a massage 2-3 days out from a competition. Because I’m very experienced with massage, I have no issues with someone really getting stuck in close before a race. M: If you were to stop having them, how do you think this would affect your performances? Do you think you would become more susceptible to injury without regular massage? J: 100% I would get injured if the massage stops. Unfortunately for me, it doesn’t matter which body parts get tight, I will always feel it in my achilles. After all these years of running I’ve never had any injuries to anything other than the achilles and these have always been caused by one or more of tight back, hips, glutes, quads or hamstrings. M: For you, what are the over-riding advantages of regular massage treatments? J: – A regular MOT, a skilled massage therapist will pick up on tight areas before they start hurting. For me this is additionally important in that my tight areas very rarely actually hurt, and instead I just feel everything in my achilles. – There is also the mental element – getting reassurances that I’m good to go, absorbing training, and in one piece. M: It has been a pleasure John! Thank you for your time, and good luck with the rest of your season! J: Thanks Michael. Good luck keeping runners running and I hope to see you next time I’m down in Brighton. John Beattie is based at his East Midlands Running Centre (click here) in Retford, near Worksop. As well as a full-time athlete, he offers Personal Coaching to runners of all levels helping them to achieve their lifetime running ambitions. Go check him out..!